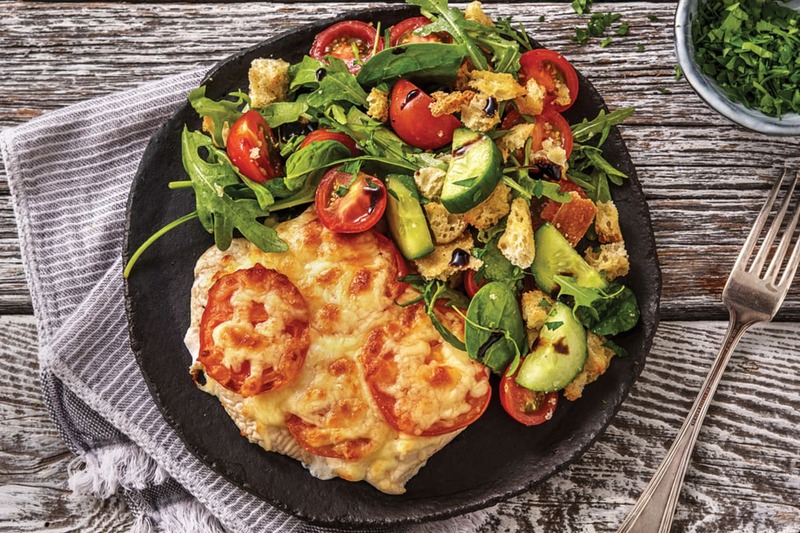 Add flavour to a butterflied chicken breast by topping it with tomato and cheese, then baking until golden! Served with a hearty panzanella salad and a drizzle of syrupy balsamic glaze for the finishing touch, this meal is almost as good as summer in Italy! Preheat the oven to 220°C/200°C fan-forced. Finely chop the garlic (or use a garlic press). Thinly slice the tomato. Cut the cucumber into thin half-moons. Slice the cherry tomatoes in half. Tear the bake-at-home ciabatta into 1cm chunks. Roughly chop the parsley leaves (reserve some for garnish!). 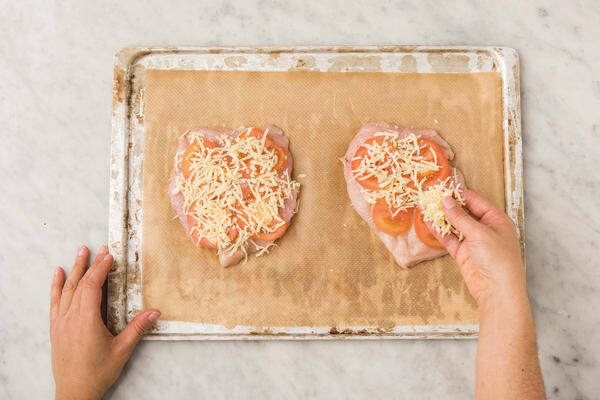 Place your hand flat on top of the chicken breast and cut through horizontally, without slicing all the way through. Open the chicken up like a book. In a medium bowl, place the butterflied chicken, garlic, the salt and a drizzle of olive oil. Toss to coat, then place the chicken, cut-side up, on an oven tray lined with baking paper. Top with the tomato slices and sprinkle with the shredded Cheddar cheese. Bake the chicken for 6-10 minutes, or until cooked through and the cheese is golden. Set aside to rest until serving. 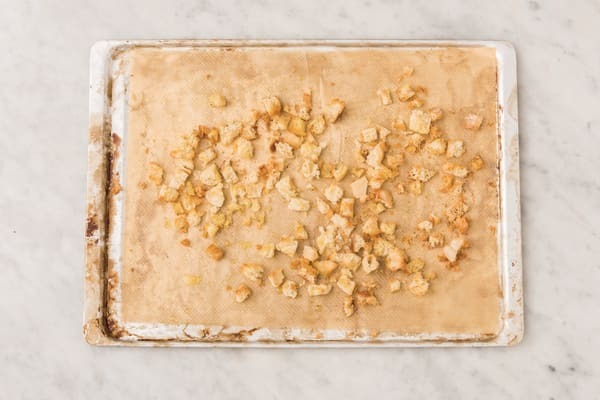 While the chicken is baking, place the ciabatta chunks on a second oven tray lined with baking paper. Drizzle with olive oil, season with salt and pepper and toss to coat. Bake for 5-7 minutes or until lightly crisp. In a large bowl, combine the vinegar and sugar with olive oil (1 tbs for 2 people / 2 tbs for 4 people) and a pinch of salt and pepper. 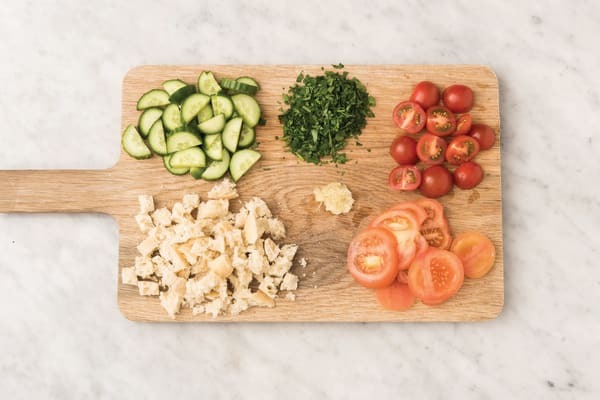 Add the cucumber, cherry tomatoes, spinach & rocket mix, 1/2 the ciabatta chunks and parsley leaves. 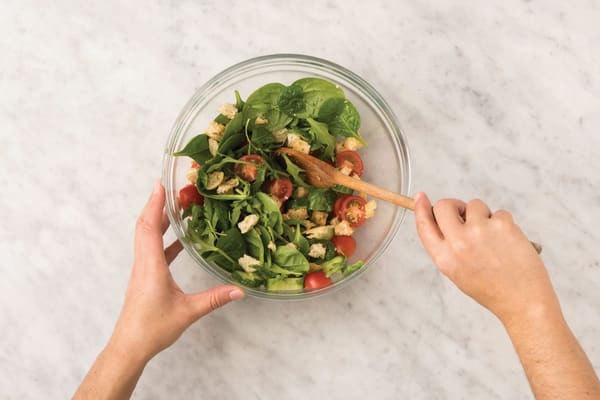 TIP: Keep the extra ciabatta in an airtight container for 3 days and add to salads. 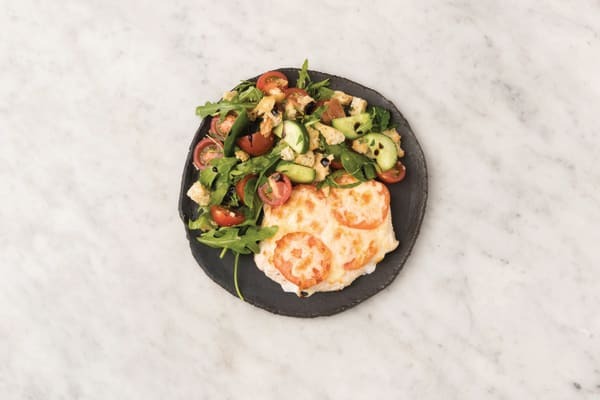 Divide the baked cheesy Italian chicken and panzanella salad between plates. Drizzle the balsamic glaze over the salad and chicken and garnish with the reserved parsley.